I was happy to see my niece and her playmates play chinese garter, one of traditional Filipino street games. I was actually surprised. In the age of computers and gadgets, I didn’t expect to see kids play these games anymore. 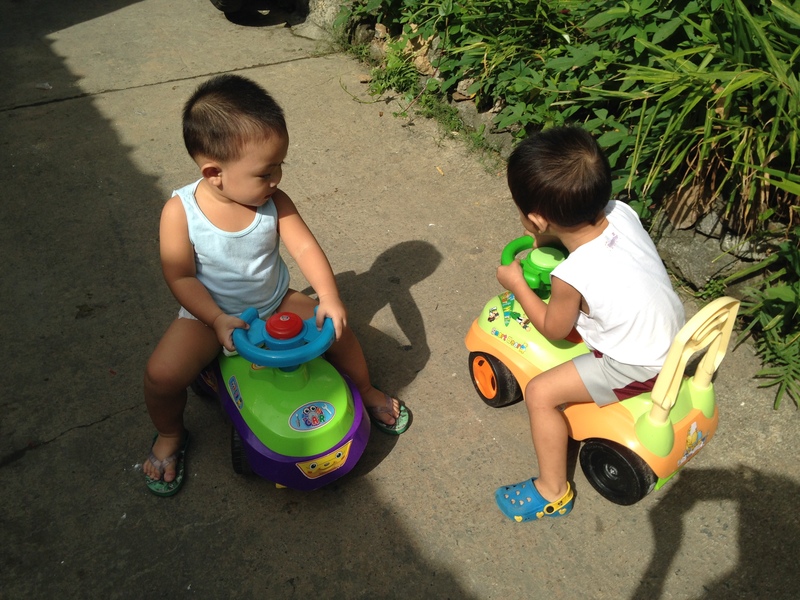 While Nina and the girls play chinese garter, Little Tashi and his playmate, Yan drive their toy cars. 1. Luksong baka – for me, this game is like training for gymnastics. Literally, luksong baka means jump over the cow. The object of the game is to jump over the crouching player or the “baka” (It) who gradually stands higher as the game progresses. A person becomes the “it” when they touch the ‘baka’ as they jump. It will repeat again and again until the players declare the player or until the players decide to stop the game. It is the Filipino version of leap frog. 2. Teks – A card game. The cards are flipped upwards through the air using the thumb and the forefinger which creates a snapping sound as the nail of the thumb hits the surface of the card. The winner or gainer collect the other players’ card depending on how the cards are laid out upon hitting or landing on the ground. I love this game. I remember keeping all my cards in a shoe box. I stopped playing this game after my Mom boiled all my cards and made me drink the ‘broth’ as a punishment for not showing up when she was calling me to run errands for her. 3. Spider fighting – One of my favorites. No details needed. I didn’t know at that time that I was being cruel to the spiders.